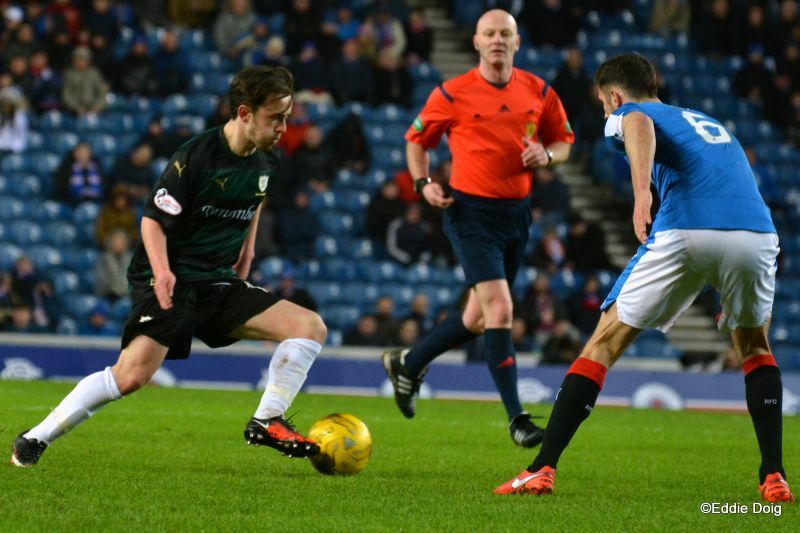 The Rovers had new signing Joel Thomas on the bench as Ray McKinnon rang the changes – Robertson, Connolly and Callachan dropped to the bench while Stewart didn’t make the line up at all. In came Barr with Toshney sitting in front of the back four and Anderson, McCord and Matthews. 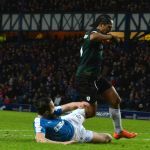 Rangers made three changes after Saturdays win against St Mirren – ex Rover Holt remained in the side but former Starks man McKay dropped to the bench. It was a decent night for football and unsurprisingly the home side started with their heads up – Holt shooting over from 18 yards. 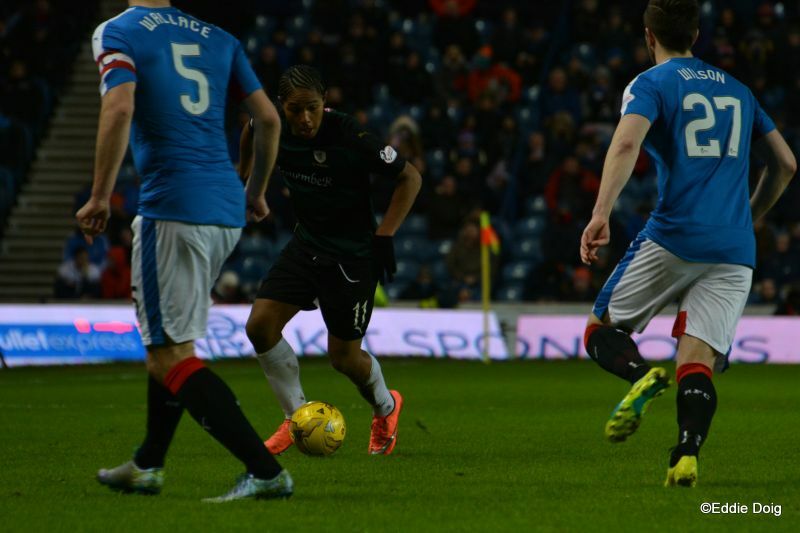 Thomson had to head a dangerous cross to safety then Tavernier shot over. Forrester made space and sent in a low shot what went wide. 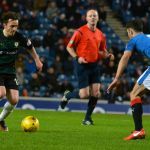 The Rovers had a couple of lines of green and black and the men in blue were able to craft long range opportunities but not get the ball past them for clear chances. This pattern continued for much of the match which oddly saw neither side penalised for an off side. In the 8th minute Toshney sent a deep cross to the far post where Anderson rose well but failed to keep the ball in. Davidson cut out a good cross before a long throw found Barr in the box but Panayiotou just failed to get on the knock down. Sloppy home play saw a cheap corner for the Rovers but Andersons shot didn’t test the home keeper. Harry was brought down and the free kick resulted in another corner for the visitors. 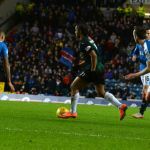 In the 15th minute Tavernier did very well to get the ball as Harry was about to shoot having got goal side as the Rovers continued to enjoy their best spell. A minute later Cuthbert made his first save from a Forrester shot – the ex Doncaster Rover looked lively throughout. Holt had a go curling wide from 18 yards before Tavernier hit the wall after a Barr foul. 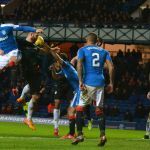 Anderson had a firm header from 14 yards but it didn’t overly test Foderingham the Craigen failed to hit the target with a tame effort. 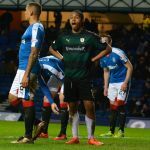 The Rovers best period ended with a goal to Rangers. Forrester worked hard to get a bit of space and curled an effort in from 22 yards giving Cuthbert no chance for the opener. Two minutes later the Rovers keeper clawed away an effort in a congested six yard box after a corner. As the home side tried to increase their advantage your correspondent – unusually in the press area – was surprised by the reaction of the main stand and some Rangers players to the awarding of free kicks to the Rovers no matter how obvious. In the 35th minute Barr’s chest blocked a shot with his arm behind his back as howls for hand ball rang out. 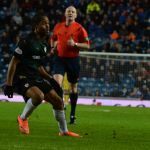 Jason Thomson was booked in the 36th minute for a run of the mill foul – a decision which was met with approval from most of the 40,662 present. Cuthbert then held a vicious strike from Forrester before a terrific cross from Thomson just eluded the in rushing Anderson. 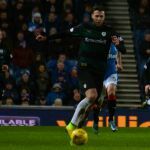 As the half wound down Tavernier saw Cuthbert claim his effort low at the post and Toshney controlled the ball with a mid air spin as the Rovers tried to carve an opening. Just before the whistle the hard working Matthews was booked. Disappointingly much of the half time free Press pie – only taken to be polite you understand – seemed to be hermetically sealed to its foil container… Anyway the home side again started brightly and good interplay was interrupted by an alert take from Cuthbert. 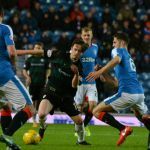 The hosts however kept pushing on and trying to pull the Rovers defence around looking for space. In the 50th minute a lay off to the in rushing Wallace was hit first time into the Rovers net. It looked an easy goal but the space was created by persistence and it was well struck. 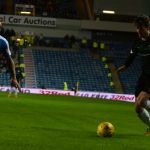 A low free kick was cleared by the Rovers before McCord was replaced by Robertson – Ryan not really having had the opportunity to show his best. 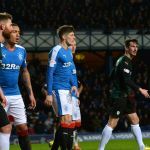 The hosts had a couple of corners and Hearts loanee Billy King was doing well wide sending in a number of dangerous crosses during the remainder of the match which his Rangers colleagues failed to take advantage of. On the hour new man Joel Thomas came on for Matthews, Anderson dropped back from his line hogging wide role and Harry remained in an attacking position. Cuthbert was quick stop a good Holt shot who’s follow up was blocked away. 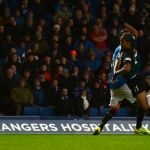 Harry who did a lot of good work eluded blue shirts and played in Thomas but Tavernier – not for the first time – just got enough on the ball to remove the danger. 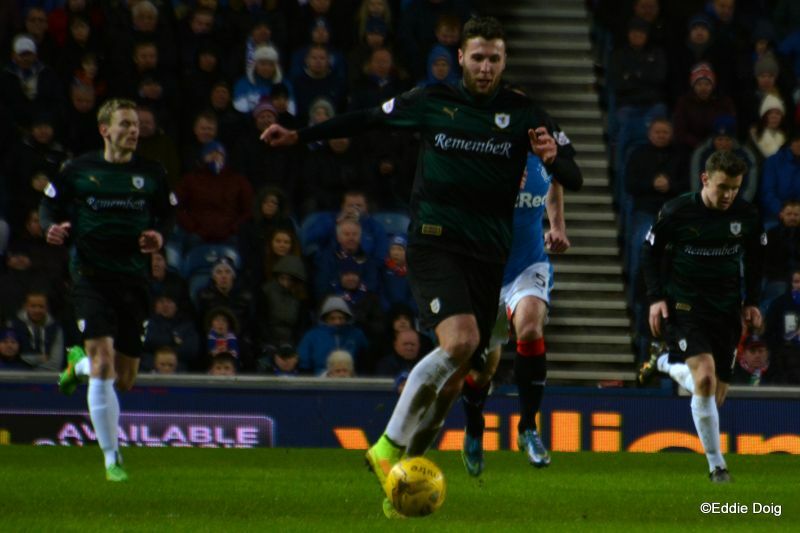 Anderson was replaced by Connolly and McKeown was booked for kicking the ball away… Cuthbert was kept busy saving best from King at the end of a Rangers counter attack after Harry had again been making a nuisance of himself at the other end. Thomas, who’d shown some good touches, had an optimistic go from near the half way line which doesn’t merit further comment. 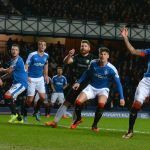 Rangers continued to fire in shots and Harry nearly got on the end of a Connolly ball running into the box as the dying minutes of the game were marked by the exodus of home fans. In the 87th minute the Rovers were awarded their first free kick of the second half despite Thomas for one having attracted some vigorous challenges. 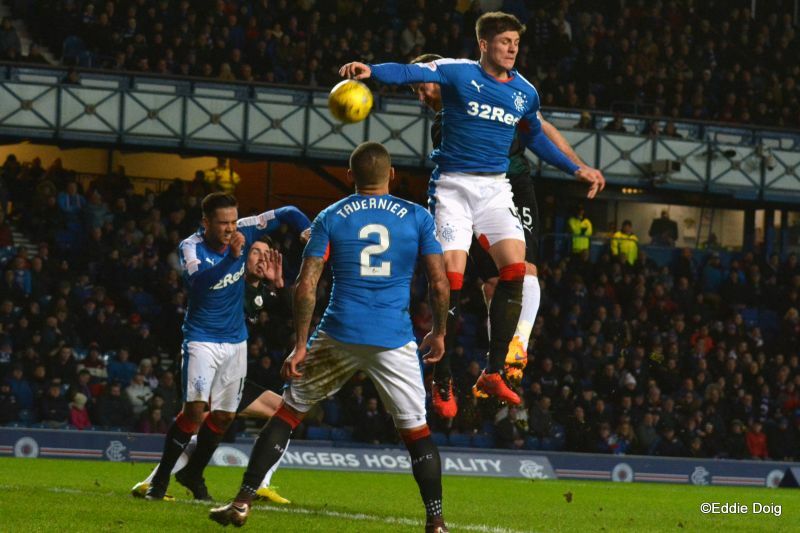 Despite some pretty poor League performances at Ibrox lately this wasn’t too bad. 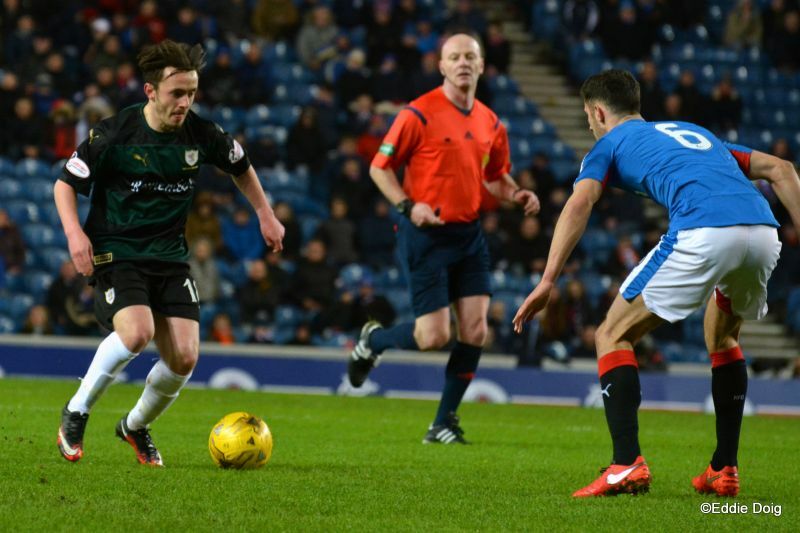 The Raith men worked hard and Matthews again showed he isn’t intimidated by large stadia. There were some positives to take on into the next few games. Welcome to Ibrox, it's a balmy 6 degrees. In recent times we have played our hosts 8 times winning twice. 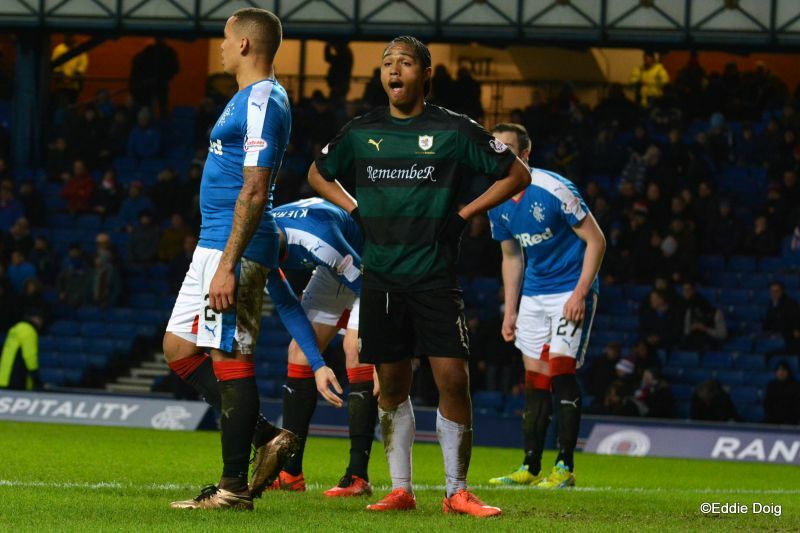 Rangers have 8 wins in the last 10 league games, Raith have 3. Rangers kind off towards the Broomloan Stand. Jason Holt with the first attempt of the game, curling the ball over the bar. Thomson heads clear from two yards out. Forrester shoots wide from outside the area. Toshney flights a ball to the back post, Anderson heads wide. Anderson fires the ball in from 25 yards, it takes a deflection for a corner. McCord wins a corner from a free kick. Matthews, Panayiotou and Craigen working the ball well, the latter sees his shot blocked. Forrester shoots from a tight angle, Cuthbert gathers with both hands. 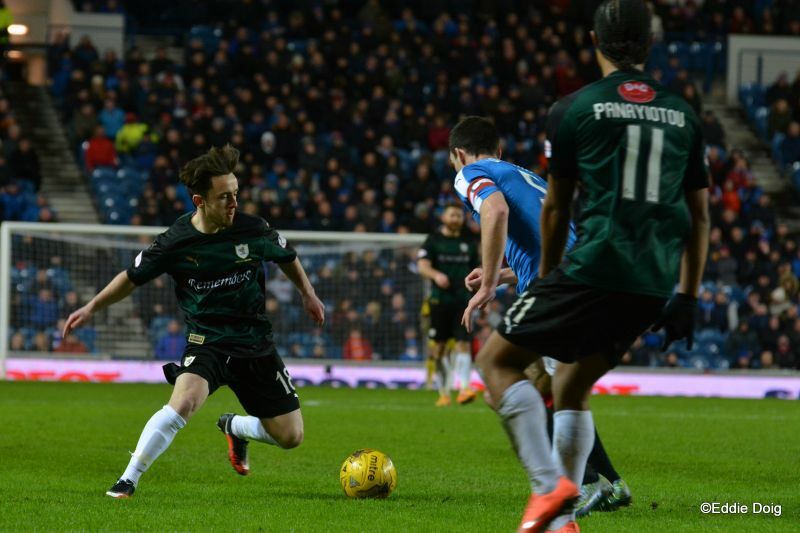 Holt repeated his earlier effort by shooting over the bar. 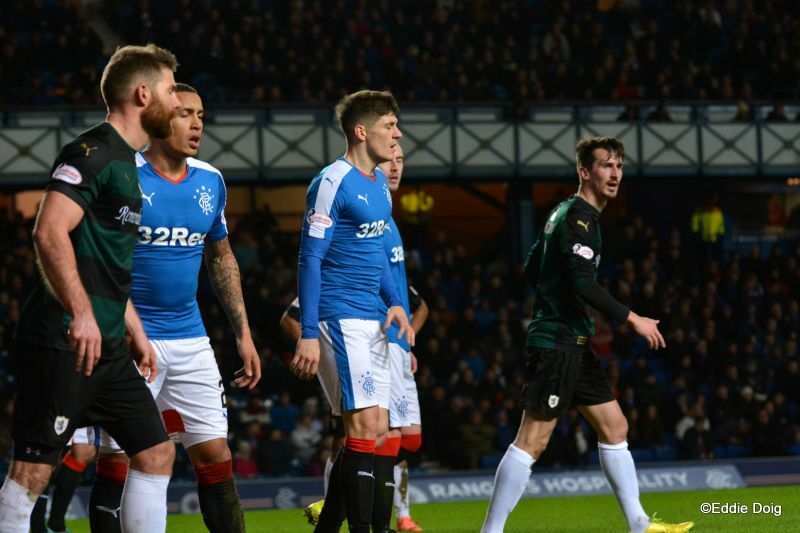 King fouled at the D, free kick Rangers. Tavernier hits the kick off the wall and into the arms of Cuthbert. First quarter over and not much between the sides. Anderson hits a soft header straight to Foderingham. Forrester is given a yard of space outside the D and fires the ball into the postage stamp corner. Goal Rangers. 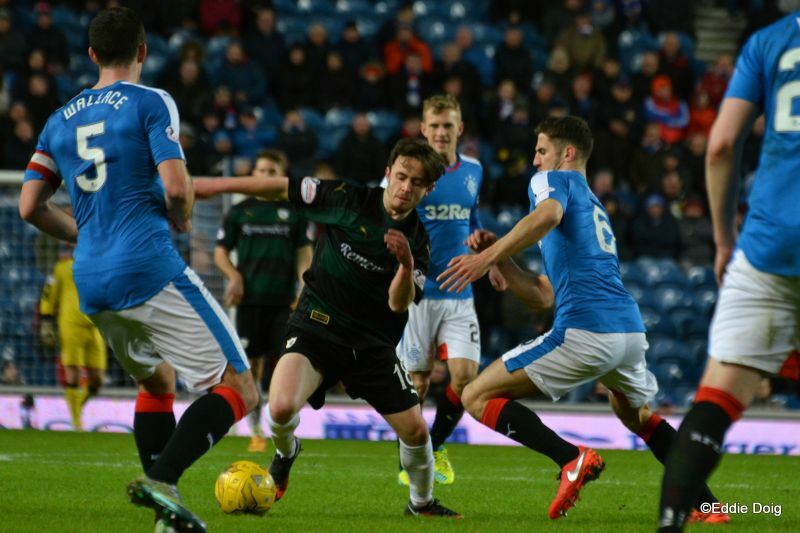 A good old stramash in the box, Thomson eventually cleared. 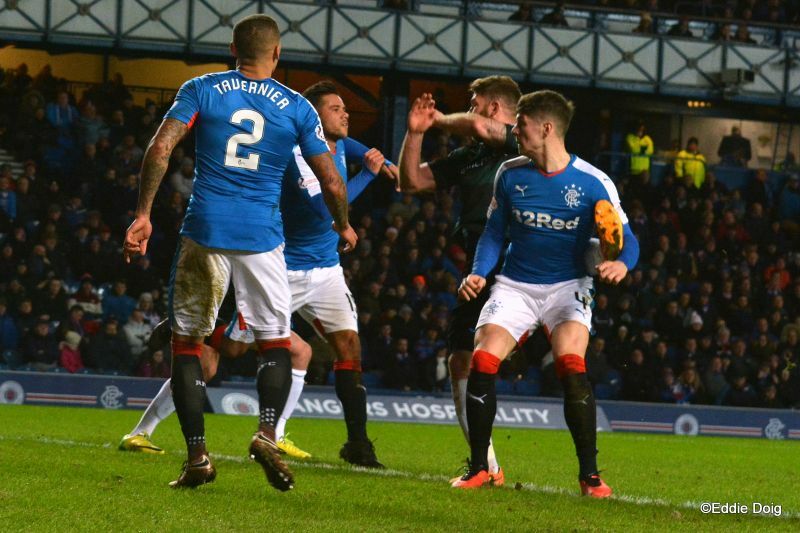 Wallace defending well courtesy of a piggyback on McCord. Davo taking a wee knock. Yellow Thomson for a foul from behind. Forrester hitting the ball from 25 yards, Callachan collects. Sorry folks, the Internet crashed for a minute or two. Tavernier hits a low ball and Cuthbert tips round his left post. 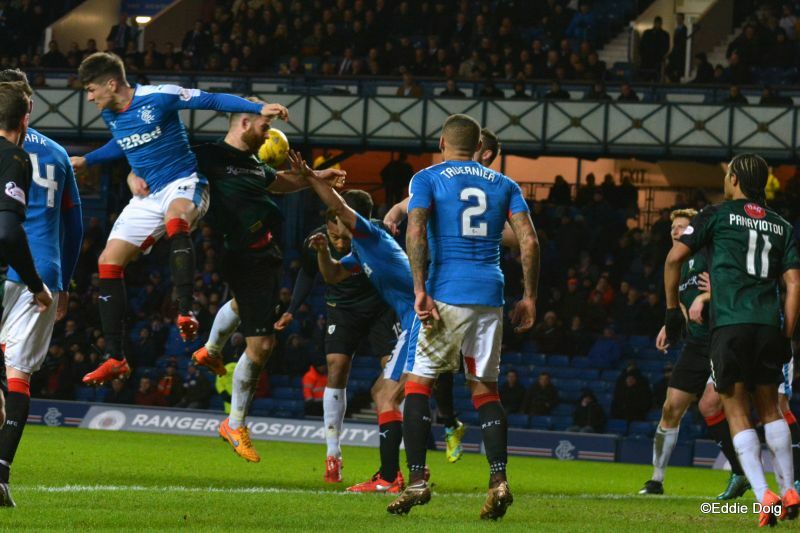 Cuthbert diving at the feet of Tavernier to end a spell of play by Rangers. 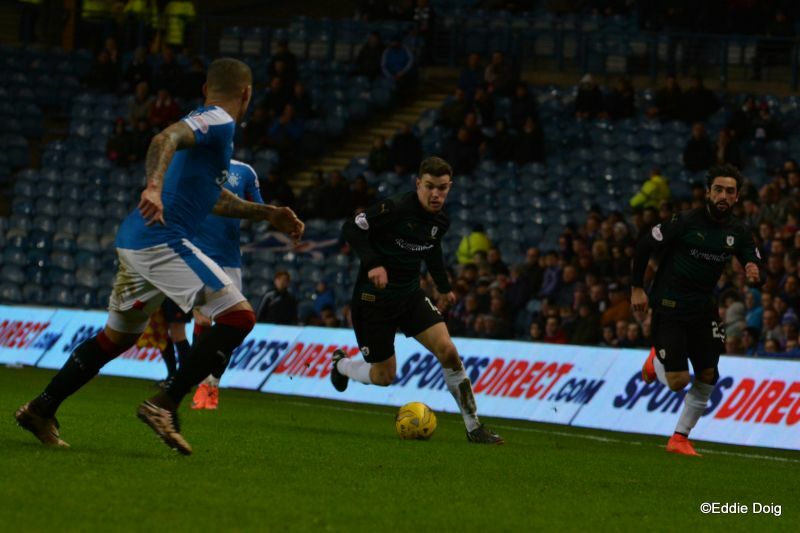 Wallace fires through a sea of legs to put the ball in at the back post. Goal Rangers. Rovers getting pushed back in their own half. Tactical, McCord off, Robertson on. King passes across the face of goal, luckily there were no takers. Tactical, Forrester off, Shiels on. Tactical, Matthews off, Thomas on. Shiels cuts in at the near post, Cuthbert tips the ball away for a corner. Holt with two bites of the cherry sees both efforts blocked. O'Halloran who has so far been anonymous shoots from the edge of the area straight to Cuthbert. 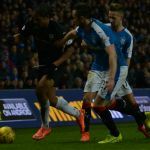 Harry puts Joel through but Foderingham clears. Tactical, Anderson off, Connolly on. 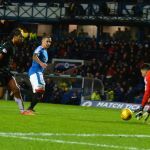 Panayiotou denied by Foderingham at the back post. Yellow McKeowan for kicking the ball away. Halliday hits a daisy cutter from the edge of the area, Cuthbert saves. King forcing a diving save from Cuthbert. Thomas, a wee bit ambitious, shoots from 40 yards and watched the ball trundle towards Foderingham. Tactical, Halliday and Holt off, Ball and Burt on. Burt has a go from about 25 yards, the ball sailing wide. King this time, sending the ball into the crowd. 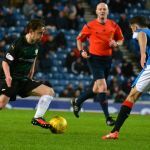 Rovers unable to get into the last third. Connolly sclaffing the ball from 25 yards. 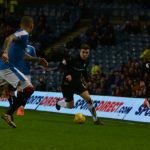 Raith Rovers head to Ibrox on Tuesday evening, looking to build on Saturday’s dramatic win over Morton, by recording their first league win over Rangers since 1970. 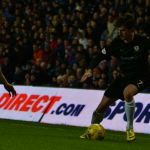 The Govan side moved 11 points clear of second place Hibernian on Saturday, with Harry Forrester scoring the only goal in a 1-0 home win over St. Mirren, while Alan Stubbs men were going down by three goals to two to Dumbarton. 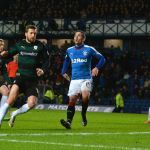 Rangers win continued their excellent recent form, which has seen them unbeaten since losing to Falkirk in December, a sequence which has included ten victories and two draws. It’ll be the third time the clubs have met this season, and the second in just over a month. 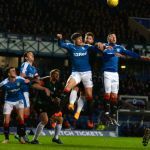 The first contest was a one-sided affair, with Rangers winning 5-0 in September, however, February’s encounter was a far tighter game, with Andy Halliday grabbing the only goal in a 1-0 Rangers win. Despite their opponents being overwhelming favourites for the match, Raith head into the fixture on the back of an upturn in form. A 2-2 draw at Falkirk has been followed up with wins over Livingston and most recently Morton, lifting them back up to fourth, with a four point cushion over Morton and Queen of the South, despite having played two games fewer than the Greenock side. Tuesday evening’s match referee will be Craig Charleston.